2018-06-06 added case1-3 data files. Path-LZerD predicts the assembly order of a protein complex by simulating its assembly process. Many important functions in a cell are carried out by protein complexes with more than two subunits. Similar to folding of a single protein, multimeric protein complexes in general follow an energetically-favored assembly path. Path-LZerD predicts the assembly path of a complex by simulating docking process of the complex. Path-LZerD takes subunit structures as input, assembles them into protein complex models using a multimeric protein docking protocol, and predicts assemble pathway of the complex from actually observed pathways in the docking process. Path-LZerD uses a multiple-protein docking algorithm (Multi-LZerD) which assembles a protein complex structure from individual subunit structures. By analyzing the assembly pathways of predicted complex models, Path-LZerD predicts the assembly order of the protein complex. In the first step, all pairwise combinations of input subunit structures are docked by a pairwise protein docking method, LZerD. In the second step, models of the entire complex are built by Multi-LZerD by combining the pair-wise docking predictions generated in the first step. In the third step, the pairwise decoys for each subunit pair were ranked by a scoring function which evaluates the binding energy of decoys. 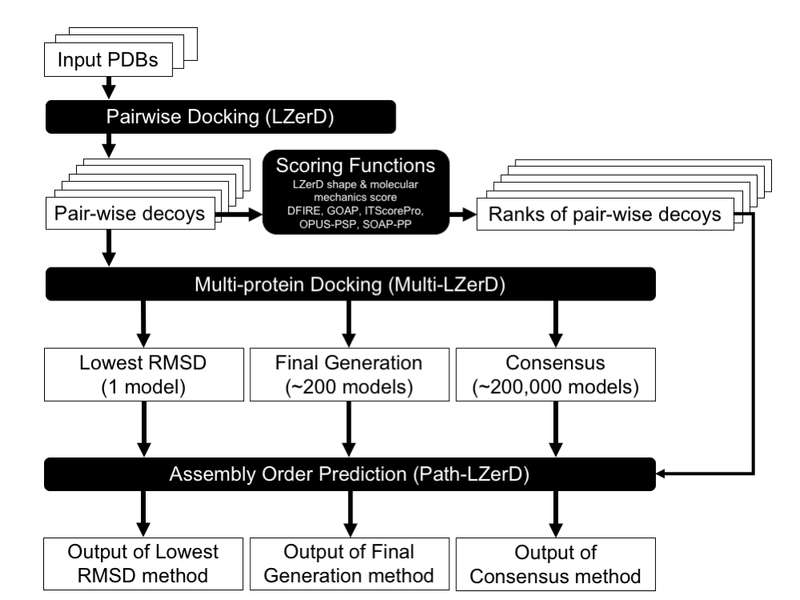 In the final step, the assembly order of the target complex is predicted by comparing the score ranks of the pairwise decoys that were assembled by Multi-LZerD to obtain the whole complex model. The current version of Path-LZerD as used in the paper is available as a zip file. Path-LZerD requires a pairwise protein docking program LZerD and a multiple protein docking program Multi-LZerD. They are available in the LZerD docking suite at the Kihara Lab website: LZerd page and Multi-LZerD page. Once all external programs and python modules are installed, PATH.ini should be modified according to the environment of user’s computer. This file specifies the location of the programs. Path-LZerD to make assembly path prediction using the output files (.ga.out) of Multi-LZerD. Before running the Path-LZerD script, users have to put the following files to the same directory. Here, we explain how to run Path-LZerD on the sample data, which are provided in the test directory. Input PDB files: Path-LZerD requires the same input PDB files that are used in the Multi-LZerD step (B-1A0R.pdb, G-1A0R.pdb and P-1A0R.pdb). The output files of pairwise docking by LZerD runs (B-G.out, B-P.out and G-P.out). The output file that contains multiple docking decoys by Multi-LZerD (finalgene.ga.out). These files show path prediction using the different scoring functions using the final generation method. The first column is showing the type of scoring function, except “sumrank”. The “sumrank” is the prediction made by using the sum of score rank by DFIRE, SOAPPP, GOAP, molecular mechanics (Molmec), LZerD shape score (shapescore), OPUSPSP, and ITScore. The second column is showing the predicted assembly order. For example, “BG>BGP” means chain B and G form a subcomplex first, then B-G complex bounds with chain P.
Peterson, Lenna X., et al. "Modeling the assembly order of multimeric heteroprotein complexes." PLoS computational biology 14.1 (2018): e1005937.